Alzheimer's agents: In laboratory research, chloroform extracts of Cinnamomum cassia produced marginal neuronal cell protection from direct betaA(1-42) insult (8). Theoretically, concurrent use of cinnamon with Alzheimer's herbs may cause beneficial, additive effects. Analgesics: In animal research, an ethanolic extract of Cinnamomum zeylanicum possessed an antinociceptive effect against both acetic acid-induced writhing and hot plate-induced thermal stimulation in mice (343). Theoretically, concurrent use of cinnamon with analgesic agents may have additive effects. Antiarrhythmics: Cinnamon has demonstrated antiarrhythmic properties in animal studies (13;​32;​33;​43;​133;​134). The effects of cinnamon with antiarrhythmic agents are not well understood. Antiasthmatics: Asthma and other chronic respiratory symptoms were seen in spice factory workers (262;​326;​327). Antibacterials: In vitro, cinnamon has demonstrated antibacterial properties (44;​46;​49;​63;​344;​345;​346). Theoretically, concurrent use of cinnamon with other antibacterial agents may have additive effects. According to secondary sources, concomitant use of cinnamon with tetracyclines may slow the absorption and reduce blood levels of tetracycline antibiotics. This effect may be due to adsorption of tetracycline by cinnamon. Anticoagulants and antiplatelets: In animal research, cinnamon bark, cinnamaldehyde, and two other Cinnamomum species (C. altissimum and C. pubescens) decreased platelet counts after long-term use (29;​96;​348;​349). Cinnamic aldehyde inhibited arachidonic acid release and thromboxane B2 formation, which may contribute to reduced platelet aggregation (350). Theoretically, concurrent use of cinnamon with anticoagulants or antiplatelets may increase the risk of bleeding. Antifungals: Cinnamon has demonstrated antifungal properties in vitro (186;​351;​352;​353;​354;​355) and inhibited oral candidiasis in humans (187;​356). In laboratory research, Cinnamomum cassia in combination with amphotericin B displayed additive antifungal effects and was less toxic compared to amphotericin B alone (357). Theoretically, concurrent use of cinnamon with antifungal agents may have additive effects. Antigout agents: According to secondary sources, cinnamon may interact with gout agents. Anti-inflammatory herbs: In vitro, cinnamon bark exerted anti-inflammatory properties (18;​30). Theoretically, concurrent use of cinnamon with anti-inflammatory agents may have additive effects. Antilipemic: In animal research, Cinnamomum zeylanicum significantly decreased serum total cholesterol and triglyceride concentrations and markedly increased HDL cholesterol levels (136;​137;​138). In animal research, cinnamate, a phenolic compound in cinnamon bark, produced higher high-density lipoprotein (HDL) cholesterol levels and a lower atherogenic index compared to lovastatin (137). Cinnamate inhibited hepatic 3-hydroxy-3-methylglutaryl-CoA (HMG-CoA) reductase activity (137). In hamsters, a water extract of cinnamon (Cinnulin PF®) inhibited the postprandial overproduction of apo B48-containing lipoproteins and serum triglyceride levels, and inhibited cluster of differentiation (CD) 36 and microsomal triglyceride transfer protein (MTTP) (359). However, these results were in contrast to another study that did not show any cholesterol-lowering effect in serum and liver cholesterol levels of rats when included in the diet at about fivefold the normal human intake level (51). Theoretically, concurrent use of cinnamon with antilipemic agents may have additive effects. Antineoplastic agents: In vitro and in animal research, cinnamon exerted antitumor and antigenotoxic effects (21;​70;​71;​72). Theoretically, concurrent use of cinnamon with antineoplastic agents may have additive effects. Antiobesity: In a clinical trial studying the effects of Cinnulin PF®, compared with placebo, the treatment group noted increases in lean mass (+1.1%: 53.7 ± 11.8kg [pre] to 54.3 ± 11.8kg [post], p<0.002) (122). Antioxidants: Cinnamon bark has been shown to contain very high concentrations of antioxidants (366). Several animal and in vitro studies have demonstrated the antioxidant effects of the essential oil obtained from the bark of Cinnamomum zeylanicum and its main components (57;​367;​368;​369;​370;​371;​372;​373). Etheric, methanolic, and aqueous cinnamon extracts have also inhibited oxidative processes in vitro (19;​47;​374;​375;​376;​377;​378;​379). 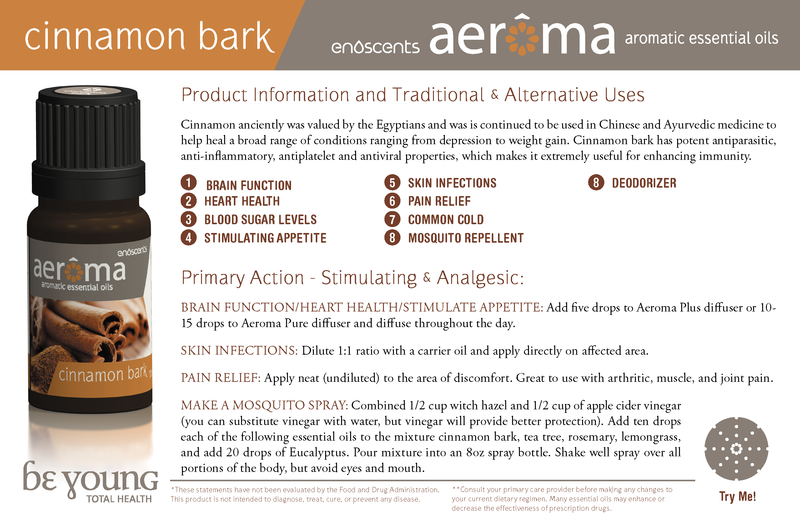 In human research, a dried aqueous extract of cinnamon (Cinnulin PF®), increased antioxidant status (185). Theoretically, concurrent use of cinnamon with antioxidants may have additive effects. Antispasmodic: According to secondary sources, cinnamon may have antispasmodic effects. Theoretically, concurrent use of cinnamon with antispasmodic agents may have additive effects. Antivirals: According to clinical research, Cinnamomum cassia bark extract may be effective against HIV-1 and HIV-2 replication in terms of inhibition of virus-induced cytopathogenicity in MT-4 cells infected with HIV (50). Theoretically, concurrent use of cinnamon with antiviral agents may have additive effects. Clove: According to a review, synergistic antibacterial effects have been observed between cinnamaldehyde and eugenol, a constituent of clove (381). Gastrointestinal agents: Nausea and abdominal pain have been reported with cinnamon use (209;​210). Hypoglycemics: In vitro and in animal research, cinnamon lowered blood glucose levels and acted as an insulin mimetic (92;​96;​97;​98;​99;​100;​101;​102;​103;​104;​105;​106;​107;​108;​109;​110;​111;​112;​113;​114;​115;​116;​117;​118;​119;​120;​121;​122). Human research, however, has demonstrated conflicting results (103;​123;​124;​125;​126;​127;​128;​129). Theoretically, concurrent use of cinnamon with blood sugar-lowering agents may have additive effects and increase the risk of hypoglycemia. Hypotensives: Cinnamomum migao oil reduced systolic and diastolic arterial blood pressure in animal research (134). Human research also demonstrated a reduction in systolic blood pressure upon treatment with Cinnulin PF® (122). In animal research, whole cinnamon and aqueous extracts have been found to reduce systolic blood pressure elevations, as well as a genetic component of elevated blood pressure (358). Theoretically, concurrent use of cinnamon with antihypertensive agents may have additive effects and increase the risk of hypotension. Immunosuppressants: In vitro and in animal research, cinnamon has demonstrated immunomodulatory effects (55;​56;​130;​131). Theoretically, cinnamon may alter the effects of immunosuppressants. Insect repellants: In a clinical trial, (E)-cinnamaldehyde (CA) and cinnamyl alcohol (CL) appeared to be effective against Aedes aegypti (L.) female mosquitoes (196). Neurologic agents: In animal research, cinnamon may exert an anxiolytic effect via regulation of the serotonergic and GABAergic systems (363). Theoretically, concurrent use with other herbs or supplements that affect GABA may cause additive effects. Photosensitizers: Alpha-amyl cinnamic aldehyde, cinnamic alcohol, cinnamic aldehyde, and alpha-amyl cinnamic aldehyde have all been identified as increasing phototoxicity (139). Phytoestrogens: Cinnamomi cortex as a component of the unkei-to combination product stimulated estradiol secretion in laboratory research (364). Theoretically, concurrent use of cinnamon with estrogens may have additive effects. Sympathomimetics: In animal research, TRPA1 agonists, such as cinnamaldehyde, have been shown to activate the sensory nerves and induce adrenaline secretion via the central nervous system (365). Theoretically, concurrent use with sympathomimetics may cause additive effects.